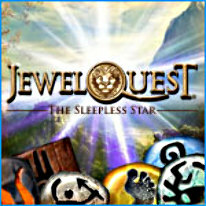 Follow the travails of intrepid explorer, Percy Pack, in Jewel Quest: The Sleepless Star. On a quest for a jewel called the Sleepless Star, Pack discovers that the jewel has been stolen from a Native American village by an unscrupulous jewel collector! Along with Percy and a beautiful Algonquin named Yellow Feather, travel to exotic locations on two continents and overcome dangers at every turn, in an effort to recover the jewel. Solve over 200 jewel board puzzles, including never-before-seen obstacle puzzles! Progress through a beautifully illustrated and fully voice-acted story that includes collectible power-ups and quest options filled with your favorite classic Jewel Quest games.